Over two years ago, we posted an article about Walter Bergman, a university professor from Michigan, who was badly beaten while participating in the Freedom Rides in 1960. In that article we honored the commitment and sacrifice that Dr. Bergman made to support and defend the civil rights of African Americans. We continue to honor the sacrifice and commitment of Dr. Bergman, with this new print from GVSU student Nathan Knoth. The print beautifully depicts the 1961 Freedom Riders in both text and image, using one of the most well know images of the Freedom Riders, where a bus was set on fire by White Supremacists while the bus was in Alabama. This is an important legacy in the struggle for Civil Rights and we all should celebrate those from West Michigan who chose to fight institutionalized racism by participating in the Freedom Rides. 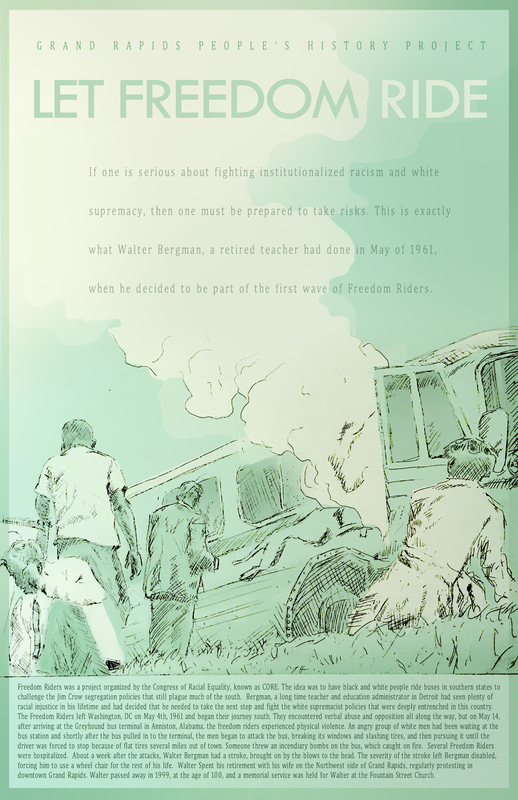 This entry was posted in Civil Rights/Freedom Movement, People's History Artwork and tagged fighting institutionalized racism, Grand Rapids Freedom Rider, Walter Bergman. Bookmark the permalink.